Toyota's all-new Supra retains its inline six-cylinder engine. Images and details. 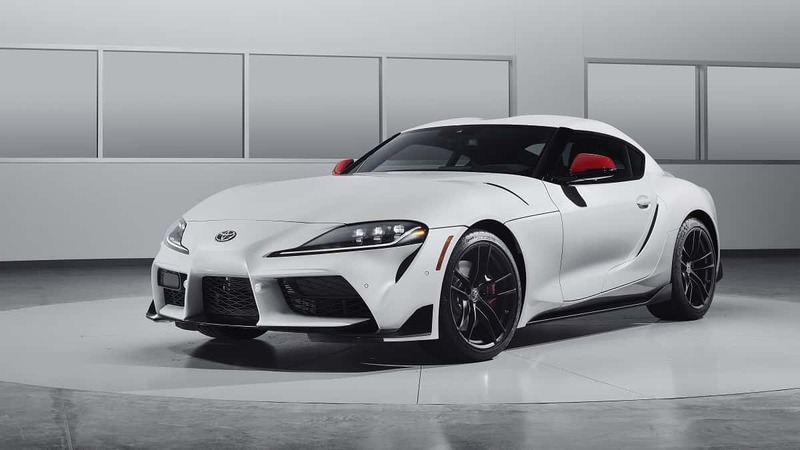 Toyota has finally released details on it all-new two-seat 2020 Supra sports car and loyalists and former owners of Supras (like your author) will have mixed emotions. First up, the price tag. Toyota says the new Supra will "start" at about $51,000. Add in nav and premium audio and the price is about $55,000. At these prices, Toyota is pricing the Supra in the same league with the Lexus RC 350 F Sport. Unless Lexus plans to discontinue that coupe. The RC's sales are trending to zero. The New Supra has a 3.0-liter, inline six-cylinder engine with 335 hp and 365 lb-ft of torque. Every Supra had an inline six, all the way back to the 1979 model in the U.S. It is nice to see Toyota keeping that link to its heritage. The Supra is also rear-wheel drive, a rare thing these days in new vehicle launches. Many sports car fans may be dismayed to hear that the Supra will not come with a manual transmission option. Instead, the only transmission will be an 8-speed auto with paddle shifters. Just like the RC. Are you one of the approximately 50% of American adults who uses an iPhone? If so, you will be pleased to hear that Apple CarPlay will be available. Are you one of the 50% of American adults that uses an Android phone (like the author and our editor)? You're out of luck. No Android Auto. The New Supra will be available this summer in its $56K launch Edition. Re: Supra's engine - "This is BMW's single-turbo 3.0-liter B58B30 unit, the same found in the M240i and many other cars from the German brand." At 50k+ and the market for coupes tanking, good luck Toyota. I'm definitely hanging on to my Infiniti G37 coupe. Suggestion: put additional power into your mainstream products. When dowdy Consumer Reports opines that a Toyota product is under-powered, there's a problem. Which Toyota vehicle did CR find underpowered? I'm just curious. Corolla Hatchback. From Consumer Reports: The all-new 2019 Toyota Corolla Hatchback offers more power than the Corolla iM that it replaces, but even with this boost, it doesn't have quite enough get-up-and-go. I have to agree. It could have used a bit more pep. A BMW (Bike Mom Walk) engine? I understand they wanted a straight six cause the old one had one blah blah. I love the car and wouldn’t trust the engine to drive across the street. As with all BMW’s (Broke My Wallet) engines/vehicles...if you give them constant attention and maintenance “they are pretty good”. Hope Toyota has BMW pay the bills for the warranty work needed on this thing. Not a chance QDR! On closer examination, of the 2019 Supra, it becomes painfully evident that it is merely a BMW Z4 clone, with minimal exterior and interior tweaks. It may be somewhat less expensive than the Z4 – if anyone is looking for a "bargain". A BMW Z4 clone indeed. That was my first thought too. Sad to put all the time and effort into a new vehicle and have folks thinking of it as a clone of another car. The first time I saw the Nissan Titan I thought it was a Ford F-150. Looks like all the car designers went to the same design school. The days of Lee Iacocca, Bill Mitchell, Harley Earl, and Carroll Shelby are way too behind us. I encourage everyone to look at these men and their influence on the automotive industry of their day!